Sometimes I go on a binge - I read all the books written by an author. While it is great to keep reading someone who writes well, it is difficult to evaluate the different books in an unbiased manner. Sometimes the characters look familiar, even identical to characters of other books, the situations seem all to similar and the dialogue can sound repetitive. But this time, I was pleasantly surprised. 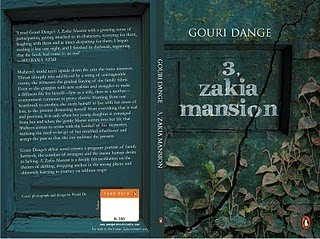 I picked up Gouri Dange's first novel, 3, Zakia Mansion, after reading her more recent "The Counsel of Strangers". It is a brief novel, hardly 160 pages or so but tells the story of Shaheen Adamji, born as the oldest child of the Karimali family living at 3, Zakia Manion, in a household made up of parents, two siblings, an orphaned cousin and a loving grandmother. The story begins with 14 year old Shaheen and appears to be a coming-of-age novel at first. The level of details in the narrative are just enough to illuminate the everyday events of a family that had seen better days while continuing to live in an ordinary life in a city. The story takes a unexpected turn with the arrival of a cousin from Junagadh, a turn that breaks apart their humdrum existence and plummets all the three children into a dismal spiral. Shaheen is the first to escape, by marrying Ayaz, a Mama's boy, who is unable to balance the two women in his life, a state that does not improve even after the arrival of another female, his daughter, Juhi. Shaheen's siblings, Ayesha and Farhan suffer longer at Zakia Mansion and head towards their own private hells. Ehsaan, the cousin who grows up with them, flies off to America and is relatively spared the sad details of those he holds so dear. A large part of the novel deals with spunky Shaheen's life as she weathers the storms and one day finds herself a divorced woman without custody of her teenage daughter. Dange has done a fabulous job of capturing the thoughts and the nuances of teenagers, whether it is Shaheen's feelings or the more vicious sentiments of Juhi towards her parents. 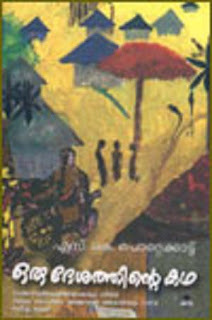 The story meanders along for a brief while until Manas, a young man, appears in her life. From this point till the end of the novel, the story keeps you riveted with the brisk storytelling style that moves the plot forward without sacrificing deeper insights into the various characters as they learn to take risks and enjoy what life brings them. There is no comparison with the later novel that Dange wrote, the originality is refreshing, as is the writing. This novel, is a great read, with characters that are real people who we all know, characters that show us that life, after all, is worth living, even as it pulls you in myriad directions.